potatoes.... they are sliced all the way along and half way down like this, so that when they cook, they open and fan out. This style of roast potato was 'invented' in Stockholm many years ago and this has become an alternative, but traditional and well-known method of cooking potatoes. Those of you following the Weightwatchers plan will know that potatoes are one of the vegetables we have to use our propoints for and they don't come cheap points-wise! So, I'm always looking for innovative and exciting ways to serve zero-pointed vegetables. I think that aubergine is one of the most wonderful vegetables, as it is so versatile and very filling. I'm excited about this invention of mine -it's fun to prepare, looks spectacular and the flavours and textures in the finished dish live up to all its promises. The combination of soft, creamy aubergine with crisp edges, pungent garlic, soy and spices blended with the roasted onion and basil, just hit the spot. It's a wonderful accompaniment to any grilled meat or fish, but holds its own as a vegetarian meal too, perhaps served with a portion of pasta or rice. Take the aubergine and cut it in half lengthwise. Spray the underside with a few sprays of Frylight Sunflower oil. Place flat-side-down on a baking tray. Make cuts with a sharp knife all the way along the aubergine about 2-3mm apart. Be really careful not to cut all the way through the aubergine as you want it to hold together, but go as deep as you dare! Make a mixture of crushed garlic and low-salt soy sauce, then brush it roughly over the surface of the aubergine and into a few of the 'leaves'. (I have a rubber pastry brush-perfect for this job). Apparently, Hasselback potatoes are also known as 'accordions' due to their appearance, but I like to think of these aubergines as little filing systems- it feels like you are leafing through index pages in order to insert the fresh ingredients. It's a bit fiddly, but so pretty once completed. Peel and cut the onion in half, then slice quite finely. Push slices of onion and whole basil leaves between some of the aubergine 'leaves'. Alternate the two ingredients, and leave some spaces in-between. Try not to make it too neat-it needs to look rustic and hand-made. Don't worry if some of the onion or basil sticks out of the top, as it goes beautifully crispy when baked. As the aubergine 'leaves' get packed out with ingredients, it becomes harder to find spaces. The aubergine will curve slightly under the strain! Spray the top with some more Frylight oil, or preferably olive oil from a pump spray. (5 pumps, then spray the oil = 1pp or 40 kcal. This is usually enough for both halves but I still charge 1pp). This helps to give a beautiful glossy finish to the aubergine, crisps up the edges and enhances the flavours. At this stage, add a sprinkle of Piri-Piri seasoning if you want a hot kick to the dish. Otherwise, just season with plenty of freshly ground black pepper. Bake in a hot oven for 20-25 minutes. If you want the top to be extra crispy, you can pop it under the grill for a few minutes. To serve, just slide a fish slice or spatula under the base of the aubergine, and transfer whole, onto the plate. Scatter with a few fresh, torn basil leaves. I served this one with a simple prawn salad. File under 'Y' for YUMMY! There's now a fabulous tutorial on my YouTube channel to show you how to make this recipe step-by-step! 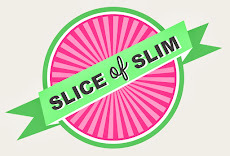 Don't forget to subscribe to the channel then you will be automatically updated every time there's a new film fresh from the Slice of Slim kitchen! Often buy an aubergine and then wonder what to do with it! got one in the fridge at the moment, so thanks for this, lunch tomorrow sorted! yum Im definitely going to try this! Sounds good - I'll have a go! I saw this recipe in the WW magazine which brought me to your blog - where everything looks amazing! I love aubergines but have never succeeded in cooking them. I can never get them to go soft and release all that great flavour and texture. I always feel that you can only get them to work if you use loads of oil So I tried this last night. It was easy to do and looked great - exactly like your picture - but the Aubergine was still hard and lacking in flavour no matter how long I cooked it for. I'd love to know what I'm doing wrong! Thanks - I think you're right - my oven wasn't as hot as that. Will definitely try it again and see if I can get it right! Thanks for your help and looking forward to trying your other recipies!